In case you didn’t know, Nintendo has been on a storm over the past year (I’m a big fan). Their stock has doubled over the past 12 months thanks to their nifty little DS handheld and motion-sensing Wii console. 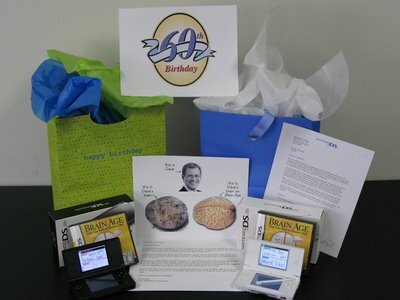 So in commemoration of Letterman’s 60th birthday, Nintendo sent the late-night host a candid and personalized letter along with 2 handhelds and games that it’s pitching to an older generation, all with an insane amount of message consistency. The letter copy is far from the bloated stuff PR peeps normally send. Have a look for yourself. Build a good product that’s in demand. You can’t make a ball roll up hill, neither can you with a crappy product. Get creative when pitching individuals, bloggers, newspapers, magazines, and TV personalities. Asking for coverage is lame. I’m amazed PR reps still do it. Get creative when pitching, and it better be good because bell cows have seen it all (see above example). Despite being a celebrity, people still love free personalized goodies. Everyone has a flattering point. Make sure you product or service can do that, and it will be a lot easier to get free coverage. That looks like a press kit, and most members of the media won’t keep the stuff. They aren’t allowed to by company and SPJA ethics standards say no. Not all media follow SPJA guidelines, but most do. Press releases are an interesting thing. They’re kind of like people who think that plugging 500 keywords into the meta tag is good SEO. They have their place, but we both know it’s not the best solution. Letterman is a different story though. Happy birthday to Dave. Yeah, most people in the press wouldn’t be able to keep a press kit like that. But nothing would prevent Letterman from keeping it. Either way, he may mention it on his show. Nintendo sent Pres. Bush a similar kit for his last birthday. (Then Nintendo sent out a press release telling everyone what they did.) The story got picked up by a few media outlets. The story didn’t even say if Bush actually saw or kept the DS – just that Nintendo sent it. My 63-year-old parents and 3 or 4 of their friends (all huge Bush supporters) saw the news story and they ALL ran straight out to buy DS Lites with Brain Age games for themselves. I’m not really sure if they bought the game because W. has one or because they heard about Brain Age via the story and thought it was usefull. Either way, Nintendo sold product – and my parents now use Brain Age all the time.